"I am finding out that I cannot deal with whiteflour and sugars. I thank you very much for your book. It was a real eyeopener. I know longer feel that it is all in my HEAD. You have given me HOPE "
"After vigorous research for good information concerning hypoglycemia, I have finally found a book that is detailed and thorough. The author talks about the different forms of hypoglycemia, rules for eating including frequency, hypoglycemic diets, as well as much, much more. This is a must have for anyone living with hypoglycemia." "Damian Muirhead’s “Overcoming Hypoglycemia” is the most helpful book on the subject I've read. I was diagnosed with hypoglycemia 20 years ago by a prominent “expert”, but found the prescribed diet difficult and support for making such big changes unforthcoming. With Damian Muirhead's guidance, I'm at last on solid ground and my physical and emotional resources are returning. His book is beautifully structured, counseling not only WHAT to do, but HOW.
" 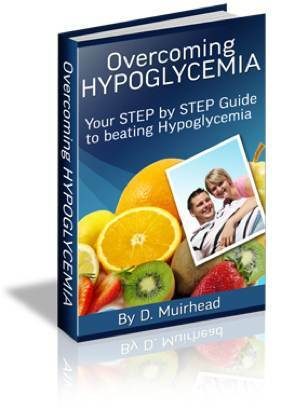 have been looking for information for over a yearon Hypoglycemia and how to control it.When I found your site, through an email, I truly was skeptical.However I have read it and even referred the ebook to a newly diagnosed diabetic.I am so very happy with this ebook, I have added it to my laptop, so I can have it handy even on trips. Thanks You so much for all the information you have supplied." "Now I have read your book I know I'm not going mad. I am 29 yrs old I have suffered all my life with depression and various other symptoms, I knew something was not right with me and I knew it was to do with certain foods but nobody understood and thought I was being obsessive about food. All I needed was someone who understood and could confirm to me that my sypmtoms are to do with food it is not in my head! Your book has done that for me, it explains everything and it is such relief, thank you"